Traveling west out of Kingman Arizona, on an early alignment of Route 66, the road begins its climb towards Sitgreaveas pass. Before the road gets too steep and narrow, and before you reach Sitgreaves Summit and begin your descent towards Goldroad and Oatman, you will first pass the restored Cool Springs and then a mile later come upon an eclectic collection of buildings and scrap metal called "Ed's Camp." Lowell "Ed" Edgarton was a miner who first came to the area in 1917. In 1919 he opened a trading post and rest stop called Ed's Camp that catered to the auto traveler. Business boomed, in fact it was so good that he never enclosed the trading post and simply put a roof over the foundation to protect it from the desert sun and wire screens instead of walls saying, "The hell with the building, we will leave it open." Ed's Camp had all the amenities needed for the Route 66 traveler of the day. 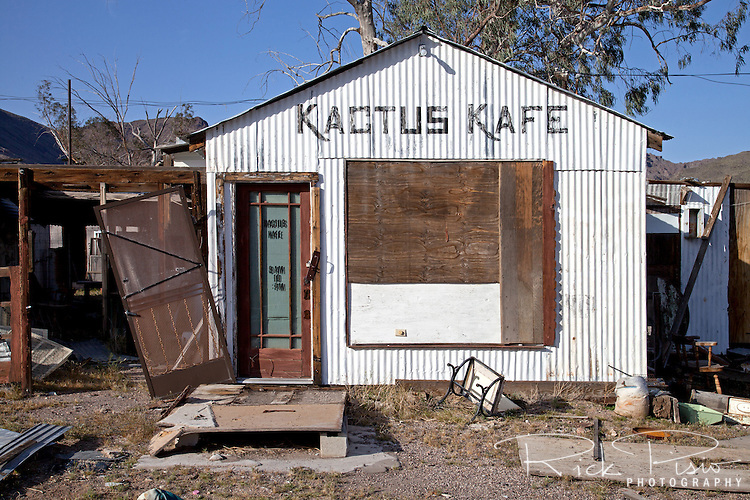 In addition to the open air trading post there was the Kactus Cafe where you could get a meal, a Texaco gas station to refuel your fuel tanks, cabins, and spots to set up a tent and camp for the night if you so desired. In 1952 when Route 66, and later Interstate 40, was routed south around the Black Mountains and through Yucca, the majority of the traffic no longer passed by Ed's Camp. Once called the "coolest spot in the desert" today the camp sits frozen time with rusting bed frames, old tires, and other debris strewn about the site.